Another book from the “If You Were Me And Lived…” series. 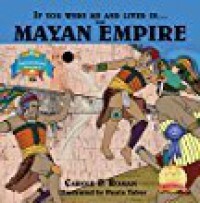 This edition is about the Mayan Empire. This series is great for kids to learn about history. Since I don’t have kids I think is also great for adults who do not read much history and want to learn by not getting overwhelmed with a huge history book. I learned many things that I did not know, like the fact that descendants of Mayans still live in the area and still speak Mayan. They placed boards on babies heads to elongated the head. They embedded jewels in their teeth. There is a lot of information in this little book. My only problem is the info does not really stay in my head but I think that is a me problem not a book problem. Luckily since it is a kids book it is small and you can re-read the book quickly. Carole P. Roman does a great job on the research of the history and on what to place in the books. I look forward to reading and learning more from the other books in the series.